Bulb acorn shaped turned cap with L pin manufactured in beech wood. H110 mm. Ball shaped turned cap with bore manufactured in beech wood. H83 mm. 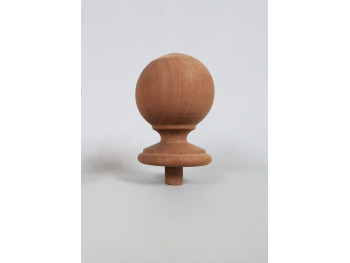 Ball top with a wooden spike thick Ø3 cm. x 5 cm long We have this model available in 2 types of woods, beech and pine Ball Ø 8.5 cm. Total length of the piece with tang including 16 cm. Attempt made of beechwood and carved on pineapple form. Measures 180x90x90 mm​​. Attempt made of beechwood ​and carved on ball form. Measures 165x90x90 mm.